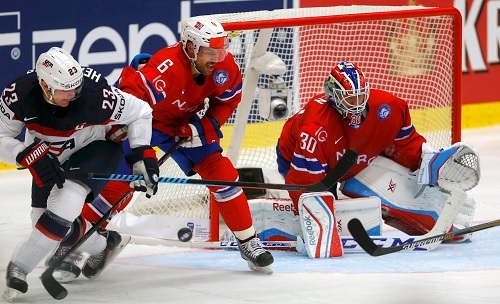 Eurolanche brings you an exclusive interview with defenseman Jonas Holos. Jonas Holos is a 26-year-old defenseman from Sarpsborg, Norway. He was drafted 170th overall in the 2008 NHL Entry Draft by the Colorado Avalanche - just weeks after he was invited to the Chicago Blackhawks’ try-out camp. Holos would go on to play the next two seasons for Farjestads BK in the Elitserien (Sweden’s top-tier league) before getting a chance to play for the Avalanche. During the 2010-11 season, Holos played 39 games in the NHL, registering 6 points (all assists) and 10 penalty minutes. 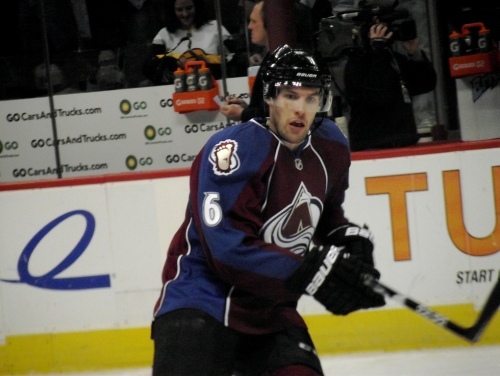 He also played for the Avs‘ AHL affiliate, the Lake Erie Monsters, suiting up for 17 games and registering 6 assists and 8 penalty minutes. He appeared in 7 games in the AHL playoffs that year, scoring a goal and an assist. Per mutual agreement, he left North America after the season and went to play for the Växjö Lakers of the Elitserien, despite his NHL contract being for two years, not just one. He played two seasons in Sweden before signing a contract with Lokomotiv Yaroslavl of the KHL, where he spent the past two seasons. He’s currently without a contract and is looking for a new team. Holos is well-known for his unusually high average ice-time, which is mostly over 25 minutes per game. He’s also an experienced national team player, who has not missed any of the past 10 World Championships. He also played at the Olympics. The Avalanche have his rights, but their rights will expire this summer. If he doesn’t sign with them until then, he’ll be able to sign with any NHL team. Your average ice-time has been the highest amongst a plethora of players in various hockey leagues. Why do you play so much? I don’t really know, it depends on the coaches. It’s mostly when I play for the national team. They say that you need to play a lot to win games and they know I have the stamina to play many minutes, so I think that’s why. Can you tell us the difference between having a 25+ and a 20 minutes ice-time? How do you feel at the end of your usual games? I actually feel better when I play a lot, because you don’t really have time to think, you just jump on the ice and do what you’re supposed to do. When you play less, you think more, so if you make a mistake, you’re going to think about it a lot as opposed to playing more, where you just go out and don’t really have the time to think about anything, you just try to play your game. I think the game’s better when you play a lot. I like the way they coach the national team, where I get a lot of ice-time. Overall, what was your highest ice-time? I think it was 36 minutes in a game against Denmark last year. Did you have a favorite NHL team and player when you were young? Yeah, my favorite team were the Philadelphia Flyers and my favorite player was Eric Lindros. You were invited to the Chicago Blackhawks camp in 2008, but the Avalanche drafted you in June that year. Was it a surprise for you? Did you expect you’d be picked by any team? Yeah, it was a surprise. I played in the Norwegian league, so I didn’t expect they’d know who I was. They probably saw me play for the national team at the World Championships, but I was a little bit surprised they chose me, because I was two years older than the others drafted that year, so it was quite unexpected and I was really surprised. It was great. You kind of get excited to play hockey again after you’re drafted. It gives you a lot. The following season, you went to play in the top-tier Swedish league. Do you think you benefited from your switch from Norway to Sweden? Yeah, it was really helpful. We had a really good team my first year in Farjestad. I had the opportunity to learn from really good players, so I became a far better player than I was the year before. It gave me a lot. You practice with better players, you play in better games. Those two years really helped. 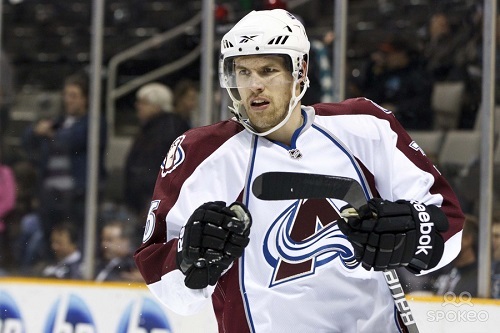 The Avalanche wanted you on their roster in 2009, but instead, you opted to stay in Europe. Why? Because the Swedish league didn’t have an agreement with the NHL, so Farjestad wouldn't let me go despite the Avalanche wanting me to come over. I had a contract with Farjestad, so I couldn’t leave. One year later, you signed a contract with Colorado. How do you remember the training camp and the overall atmosphere in the team? I was a little bit nervous at first, because you get to practice with big stars. You have a lot of respect for those guys. I found out that the level of hockey wasn’t too much for me, that I could play, so I got more comfortable. I earned a spot in the team in training camp and I felt pretty good. I played about 12 games before I got scratched. I spent a lot of time just watching the games from the stands, which was pretty tough. I had a lot of ups and downs, mostly because I didn’t get to play for a long time. I learned a lot that year; it was surely something I benefited from later on. How do you remember your first NHL game? It was a road game against the Islanders and I was really nervous. After the ref dropped the opening faceoff, the wingers got into a fight, so I was like what’s happening. The game was interesting right from the start and I think I played a decent game. I got to play a lot of minutes. It was fun to just be in the NHL. In November, just weeks after the start of the new season, you were sent down to the AHL. Were you disappointed? Of course. It was tough. You want to play in the NHL, so playing in the AHL was pretty tough. The only think you’re thinking about is when you’re going to get called up again. You watch Avalanche games to see if someone gets injured or something they’d need a call-up for. You think about it all the time, so it’s really tough mentally. Can you compare NHL and AHL games? I’d say everything’s faster and better in the NHL, every player’s stronger, thinks faster and is more skilled. The 20 guys playing on a team in the NHL can do stuff that player’s in the AHL can’t. How do you remember then-coach Joe Sacco? He was frustrated after the season, because we finished second-last I think. We had a lot of tough practices and a lot of meetings after bad games. I can’t really remember. We had a tough time as a team and he wanted us to play better. What was your favorite defensive partner? I’d say John-Michael Liles. He was a really skilled defenseman. 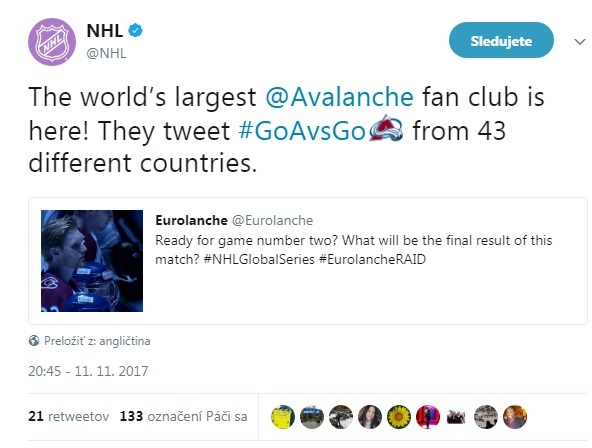 What did the Avalanche tell you after that season? They haven’t really told me anything. They just told me I had to go down to the AHL to play in the playoffs. What did they tell you when you told them you’d play in Europe next season? They weren’t happy. They were disappointed, but at the same time they sent me down to the AHL during camp, so I felt like they don’t have a plan for me and if they did, they didn’t tell me about it. It felt like the right choice to make. Why did you decide to go back to Europe? Because they sent me down during camp. I felt like they gave others the chance I was supposed to get. Also, there were about 9 defensemen in Colorado that year, so I was low on the depth chart. The main reason was that I wouldn’t play in the NHL that year and if I didn’t play in the NHL, I’d rather play in Europe. Since then, have you been in a contact with the Avalanche? Did they contact you at any time? No, no contact at all. They still have your player rights until this summer. Would you like to come back to the Avs? Are there any negotiations between you and the Avalanche right now? * Holos' agent confirmed for Eurolanche that he is talking with the Colorado Avalanche these days, but no specific offer has been made. As the agent himself said, there’s still enough time for this and Jonas will only sign a one-way deal. What’s your favorite memory of your international career? I think our first World Championship in Stockholm in 2012. I think a lot of us played the best games we’ve ever played. We were outstanding in some games. We scored lots of goals. It was fun. We got Russia in the quarterfinals and got beaten 5:2, but it was a great experience overall. Also, the World Championship in Slovakia, where we played in Kosice, was great, too. A lot of people expected us to get hammered, because we were without our best players like Zuccarello, so it was a team made up by young, inexperienced guys, but we advanced to the quarterfinals. I’d say this was our best tournament, expectation-wise. Do you know which European team you might play for next season? Are there any hot candidates? Of course there are some hot candidates, but nothing’s decided yet. I can’t say anything right now. I hope it will be in the KHL, but I don’t really know right now.